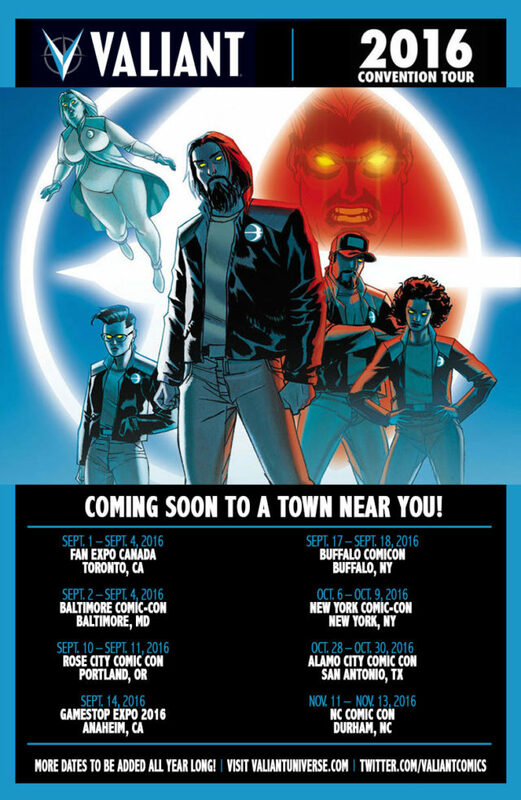 Visit Valiant at the New Jersey Comic Expo – This Weekend! After more than 40 dates from Florida to Washington State, Valiant’s can’t-miss convention tour is adding an extra stop this weekend in the Garden State! On Sunday, November 20th, Valiant joins the New Jersey Comic Expo at the New Jersey Convention and Exposition Center in Edison, NJ with VALIANT: THE FUTURE OF VALIANT AND BEYOND – an action-packed panel presentation spanning all of the award-winning publisher’s biggest series of 2017! Kicking off at 2 pm ET in the Creator’s Lab (Meeting Room 1), get the inside track on Valiant’s biggest year of new releases yet with in-depth discussions and never-before-seen artwork! With a record-setting 50 Harvey Award nominations, Valiant Entertainment is the most acclaimed publisher anywhere in comics today. Now, find out what’s next for powerhouse series like FAITH, GENERATION ZERO, BRITANNIA, BLOODSHOT U.S.A., HARBINGER RENEGADE, SAVAGE, and DIVINITY III: STALINVERSE right here with an all-star cast of panelists, including Assistant Editor Lauren Hitzhusen, Assistant Editor Danny Khazem, and Vice President of Marketing & Communications Hunter Gorinson! The future of Valiant starts here with an exclusive round of updates – only at the New Jersey Comic Expo! We’ll see you in the Garden State! And look for more cities to be added to Valiant’s non-stop convention roadshow in 2017!